Formative Pruning - is normally completed 3-5 years after planting and establishment of young trees. It is a practice used in the tree nursery, but can be resumed following planting and establishment to influence the structure, shape and size of the trees crown, encouraging good or practical form and a defect free tree for the future. 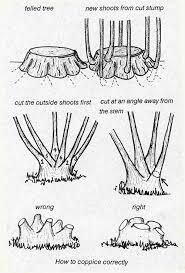 Restorative Pruning- is a practice usually undertaken to "restore" the crown or structure of a tree that has been poorly managed or has suffered crown damage i.e. storm damage to promote a healthy form and growth structure. Crown Reduction and/or Reshaping - is a practice normally to reduce a crown in proportion to it's original shape leaving a strong framework of healthy small-diameter branches and leaf bearing twigs. A reduction can be carried out for various reasons but not exclusive to, such as to retain a tree within confined space or to reduce sail and wind-resistance where structural issues maybe a concern. Crown Thinning - is a practice of thinning a trees canopy creating an even density well spaced and balanced crown structure which could provide an adequate framework for possible future crown reductions. This operation is often used to allow light through a tree canopy. 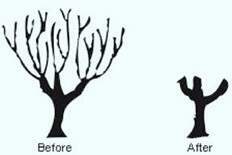 Crown Lifting - is a practice of pruning branches to achieve a desired vertical clearances above ground level, other surfaces and/or structures. Pollarding - is a practice completing soon after a tree has become established following planting. It is a traditional operation of tree management dating back millennia. Once initiated, pollard management should be maintained on a cyclical basis. Coppicing - is a traditional method of managing certain species of trees, to promote regrowth for use as wood products, but also to increase wildlife. Coppicing usually entails the felling of a maiden tree creating a stump which regrowth will develop and be managed over number of years. Felling - tree felling/removal can be controversial but in some circumstances there are no alternatives and trees have to be removed. Often this is mainly for health and safety reasons, or trees have outgrown their situation, are causing direct/indirect damage or to facilitate development. At Morfe Valley we can offer advise and professionally carry out the removal of a tree(s) either by felling or sectional dismantling. Stump treatment and Removals - depending on species and location, the treatment of stumps will vary. Certain species of trees should receive herbicide application following felling/removal to prevent regrowth, others can be grubbed out or stump ground. Hedgerow Management - is important not only for the aesthetic appearance a well managed hedge can provide but also for privacy, security, practical functionality and for the wildlife they support. At Morfe Valley we can provide expert advice on the management of you hedgerow through traditional methods of hedge-laying, classical shaping and manicuring, restoration of neglected hedgerows or establishment of new hedging. Tree / Hedgerow Planting - planting and establishing trees is important part of tree management, often tree planting is an over looked part of the industry. At Morfe Valley, we can provide advice on suitable species of tree and hedge planting and we can supply directly from the nursery. We are able to offer planting and establishment of new trees and hedgerows. Propping and Bracing - as trees grow they can often develop structural problems which if not managed correctly can lead to loss or part of a tree. Propping and/or bracing techniques can be used as support aids where structural issues cannot be managed with surgery alone or surgery is inappropriate. Often it is used for important, historical, ancient or veteran trees. For friendly advice on the management of your trees, please contact us and we will be happy to help!